One of the most fulfilling aspects of working at ActionVFX, is having the opportunity to see our work help compositors and filmmakers across the world achieve realistic results with our professionally captured VFX elements. Today, we’ll see exactly what that process looks like in our interview with Sindre Johnsen, a Lead Compositor at CoSA VFX Vancouver, who recently completed work on the hit mini-series 'Waco', starring Michael Shannon and Taylor Kitsch. Luke: Hey Sindre! Thanks so much for joining us today. I really appreciate you taking the time to talk VFX with us! So, to kick us off, how exactly did you get into doing visual effects as a career? Have you always been interested in working in the film industry? Sindre: I've always had a huge passion for filmmaking, visual effects and being creative in general. When I discovered photo and video editing in secondary school, I was hooked. In school I pretty much tried to make a film or do some VFX every chance I got. Even my master thesis had about 40 VFX shots in it. Which is a probably a lot considering I went to university for architecture, haha! After I graduated, I wanted to give VFX a full time go. I was self-thought and up until then I’d only been doing it on a freelance basis, working on a few commercials and shorts while I was studying architecture in Norway. So, in the beginning of 2016 I cut together a reel of my VFX shots, sent it over to CoSA VFX, booked a ticket to Vancouver and I’ve been here ever since. I do love that I get to work with something that started out as my hobby. Luke: That is extremely cool! It seems like you've been building up some nice credits lately, as well. Out of all the projects you've worked on thus far, which is your proudest? Sindre: I've had the opportunity to work on a lot of great projects at CoSA that have all challenged me in different ways. I think one of the struggles that we constantly face is time and trying to push the quality of what we do on a compressed TV schedule. The cool thing about that is you’re often forced to think outside the box to problem solve the shot you’re working on. I remember a while back I was tasked to comp a guy’s face burning and melting off for Lucifer. I didn’t have any CG or dynamics to help me out, so I tried using time-lapse footage of melting pizza and sizzling bacon to act like the skin was melting off. It ended up working really well and it just shows that you literally can put bacon on anything. Luke: Haha! I love that. When I first saw that breakdown I was really confused, but after seeing the finished shot, it was really impressive how well the textures tied together the face melting effect. Sindre: I also remember learning a lot from one of the RnD shots I did for Waco. 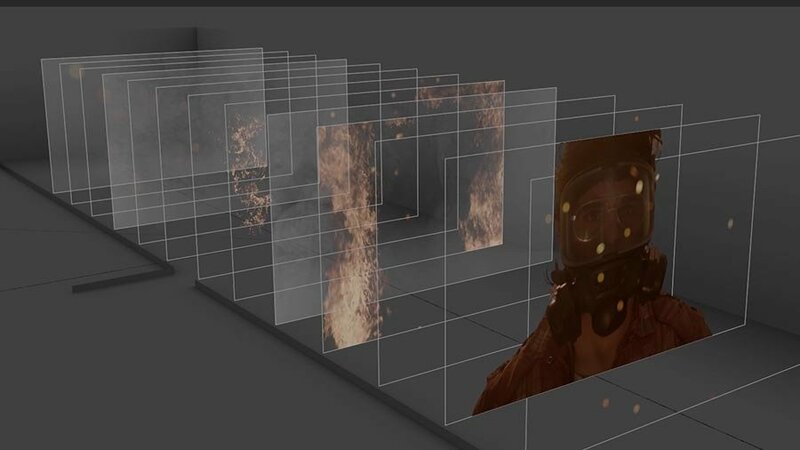 I did all aspects of the shot: Starting with the DMP and re-creating the entire compound and the environment, adding FX simulations of smoke stacks, explosions, fire, CG helicopters and hundreds of 2D elements of shattered glass, debris, ash, embers, interactive lighting and atmosphere. It was great, I had the time to experiment and try out a variety of techniques. Unfortunately, since it was only a RnD shot it never aired, but I got to utilize a lot of that knowledge when I was working on the exterior shot of the compound. 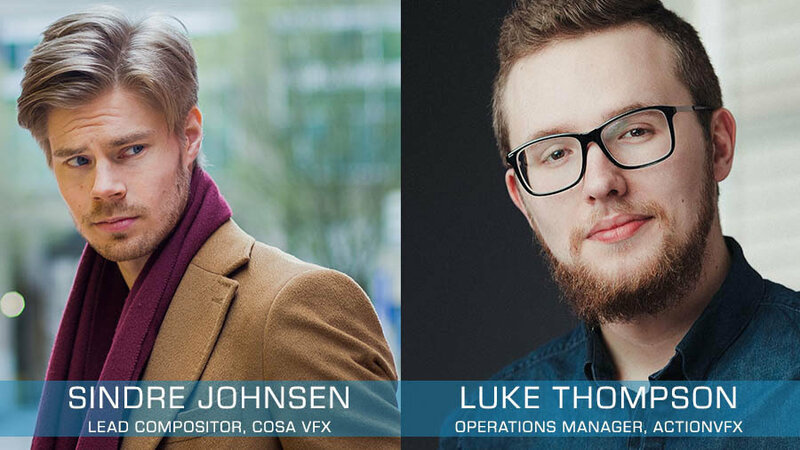 Luke: It's great that you're an ActionVFX client! What are some of the recent projects you've used our elements in, and what was your experience of using ActionVFX assets like? Sindre: I use them in pretty much every project I work on now. Most recently Lethal Weapon and Waco and a few really cool upcoming projects that I can’t talk about yet. It’s amazing to work with the elements. They have great resolution, high frame rates and lots of dynamic range. For the trailer shot I did on Waco the plate was shot in slow motion with existing fire already in it, so adding in any elements meant matching both speed and brightness to what was already there. Having elements that don’t clip and have a lot of detail even when exposed down made matching the real fire a lot easier, and meant that I could spend more time on other more creative aspects of the shot. The elements were placed on cards in 3D space, allowing me to use Nuke’s Ray trace renderer to accurately create reflections on his mask. Having elements that were exposed the same made it easy to swap them out and art direct them without having to redo all the grades every time. This way I could cycle through them, pin down the composition and framing and have the reflections mirror the changes instantly. Luke: What would you say is a useful technique that you used while compositing to help elevate the realism of these shots? Sindre: A great technique I used a lot for the interior shots was blurring the fire element and multiplying it with smoke or an atmospheric element. When this gets merged back over the fire it creates the illusion of the smoke being illuminated by the fire and adds a lot of extra realism to the comp. Sometimes I would only use that in a shot: Placing the fire off-screen so it wouldn’t be too distracting in the scene and steal focus from the performance, but still keeping its presence with some licks of illuminated smoke every now and then. Another quick one would be to add a 3-step glow, having glows that range in size and intensity from small to big, creating a more natural falloff. Luke: In what ways have you found ActionVFX elements to be beneficial to your workflow? Sindre: It’s extremely easy to work with the elements. They’re high quality, high frame rate, great dynamic range with tons of detail and they don’t break frame. I especially love the elements that interact with geometry like the structure fire or the ground fire elements. The explosions are great too. I sometimes even mix them into our CG explosions to add some extra detail. Luke: If you had to give one piece of advice to an aspiring visual effects compositor, what would that be? Sindre: I think I’m still an aspiring compositor, but I would say try and learn a little bit about everything, not just in terms of VFX but also filmmaking, cinematography, art and design. Having some experience with photography, knowing how a camera or lights behave go a long way when trying to integrate something and making it look real. Try and shoot stuff on your own and use the real world as reference as much as possible. It can be tempting to use other movies sometimes, but as my VFX Supervisor Marshall Krasser once told me, you’d just be copying a copy. Luke: That is some great advice, for sure! Thank you again for carving out some time in your busy schedule to give us some insight to your work at CoSA VFX. I’m really excited to see where you go from here! Sindre: Thanks for taking the time to chat with me. Can’t wait to see what you release next. I had the pleasure of binge-watching the entire series recently, and it's yet another example of realistic visual aids contributing to the emotional draw of a good storyline. If you haven't already, go give it a watch!